For a few years now, I’ve been saying that black spots on black eyed susans (rudbeckia species) were not a fungus. I even had seen insects on my black-eyed susans that I was sure were causing the damage–the four-lined plant bug. I am not necessarily backing down from that diagnosis–but in researching some diseases for another post I came across some information about some diseases of rudbeckia. And I now think it’s possible that mine have at least a combination of insect damage and a leaf spot disease known as septoria. Prior to this, I only thought of that disease as affecting tomatoes. Of course, every extension service Bulletin I’ve read suggests spraying some strong chemical fungicide or copper to control this problem. I am willing to do neither, just as I am unwilling to do anything to attempt to treat for the four-lined plant bug. This fact sheet from the University of Minnesota (one of the few with relatively good photos) has a decent discussion of fungal diseases affecting Black-eyed susans. They note that for their climate, septoria leaf spot is relatively common and the others are not. So how do I plan to proceed? Basically the same way as always–with very good sanitation in the fall to prevent any over-wintering of “whatever:” fungal spores or insect eggs. I’ll thin my black eyed susans a bit to increase the air circulation–that can never hurt. But I don’t do any overhead watering. So I can’t stop that. What nature does is a different story! And since this June she’s dished out a lot of “overhead watering” (4th wettest June on record) I suspect that this year, at least, my black spots could indeed be some sort of fungal issue! My rudbeckia ‘Goldsturm’, supposedly pest free and foolproof, got such a bad case of blackened leaves that the pretty flowers couldn’t make up for their ugly black bottoms. The whole plant was affected. I thinned them, cleaned up, was tidy about winter hygiene, and still the next year the plant leaves turned totally black on the entire plant. Those rudbeckias are gone now, I had to take them out. They were replaced with rudbeckia fulgida var. fulgida, which are fine. 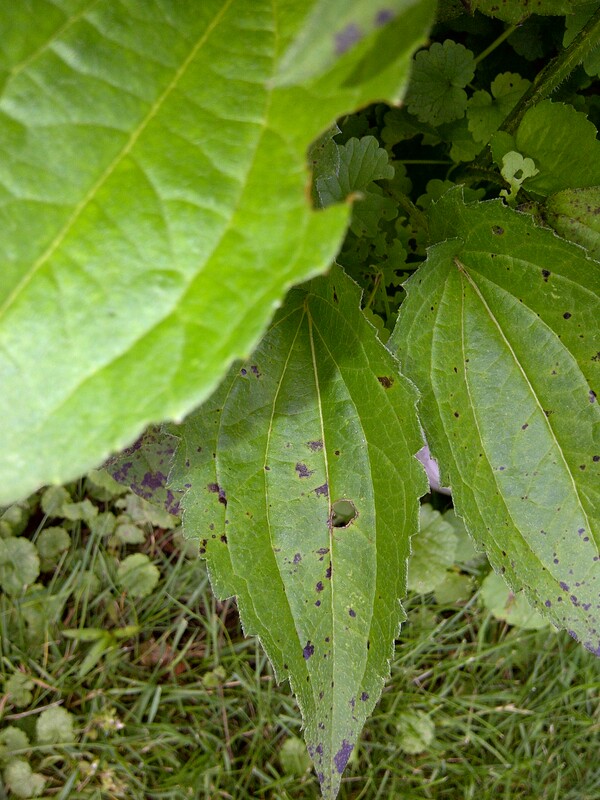 Later research told me ‘Goldsturm’ is particularly susceptible to a bacterial infection called angular leaf spot. Not a fungal septoria, but a bacterial problem. I couldn’t fight it. Interesting. For years when I worked at a garden center they used to say, whenever anyone came in with black-eyed susan issues, “Oh it’s a fungus” and just dismiss it off-hand and sell them some fungicide. We both know fungicide never cures the problems but only slightly improves the look of the leaves–if you’re lucky! I never had any issue with mine until some golden oregano started getting this same whatever. I pulled the golden oregano and in the process found this insect I referred to. Coincidence? Maybe. But I’ve got probably a border of 16′ of these things–all self sown from one cutting. Removal would be problematic–not impossible, but certainly not pleasant. Thanks for reading and sharing about what we now both know to be a totally NOT pest free plant for whatever reason. I’ll look into your bacterial infection. It could be I have some digging ahead of me!